Lawyers in Your Living Room! 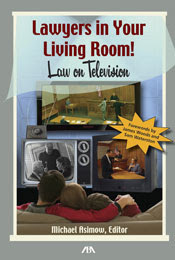 Law on Television is new in the library this summer: PN1992.8.J87 L39 2009 at Good Reads. Written in an entertaining and relatable style, you'll enjoy the forewords by Sam Waterston (Law & Order) and James Woods (Shark), who share their experiences playing "real-life" lawyers and how their roles have shaped the way lawyers are perceived by the general public. Lawyers in Your Living Room! begins with an introduction and history of law on television. It then discusses the process of writing for television -- from courtroom to writer's room and how lawyers have played an important role in furnishing technical advice for TV. The book also discusses the media effects from television shows and legal ethics on TV. Included are chapters on daytime television judge shows, including Judge Judy, and non-legal shows with important lawyer characters like The Simpsons, Seinfeld, or West Wing. The most popular television series, past and present, are also discussed, as well as popular shows abroad. All fans of legal television -- a group that includes almost everybody -- will enjoy this discussion of how TV shapes the views of lawyers and the law. The ABA Journal is going to begin profiling (in print and online) lawyers who are "remaking their corners of the profession. . . ., finding new ways to practice law, represent their clients, adjudicate cases and train the next generation of lawyers." You can nominate "legal rebels" to be profiled, and you can participate in a wiki to draft the Legal Rebels Manifesto. See Legal Rebels - Who's a Legal Rebel? From the USC's Annenberg Center comes The Redistricting Game, an opportunity for you to redraw districts in the fictional state of Jefferson. The game provides a basic introduction to the redistricting system, allows players to explore the ways in which abuses can undermine the system, and provides info about reform initiatives - including a playable version of the Tanner Reform bill to demonstrate the ways that the system might be made more consistent with tenets of good governance. The site also provides a glossary and links to information about redistricting in each state. Looking for a good summer read? Even (or especially) if it’s not terribly law related? Want to fall in to a book and do a little arm chair travelling? Try Donna Leon’s police procedural series, featuring Venetian Commissario Guido Brunetti. Well written and evocative, the stories feature Venice as if it were a beautiful yet flawed character. Justice, corruption, morality, mortality, architecture, and food are all grappled with in this excellent series. The list of titles, in order, can be found here. 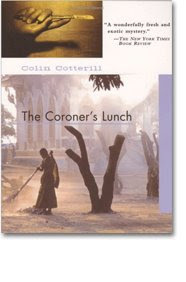 Or try Colin Cotterill’s unusual series, set in Laos in the 1970s, featuring a rather unusual national coroner, Dr. Siri Paiboun. Communist politics, the spirit world, and wry humor? The combination works. Start with the first title, the Coroner’s Lunch.